Hoover Building is an example of Art Deco architecture designed by Wallis, Gilbert and Partners (1932-38). John Betjeman described it as, “a sort of art deco Wentworth Woodhouse – with whizzing window curves derived from Erich Mendelsohn’s work in Germany, and splashes of primary colour from the Aztec and Mayan fashions at the 1925 Paris exhibition. Perivale’s art deco masterpiece, which watches over the A40 like a silent sentinel of the approaching city, is as glorious now as it was in its 1930s heyday. 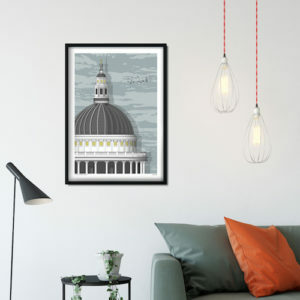 This blank card features Hoover Building and is the perfect gift for anyone who loves London architecture.